It’s not often that I read a “business” book and find myself dog-earing pages and making little exclamation marks in the margins. But that’s what I did with my not-so-new-looking copy of Content Rules by Ann Handley and C.C. Chapman. While content marketing is becoming widely accepted as a marketing practice, it’s got a long way to go to before it’s mainstream. 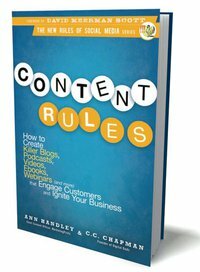 Books like this one can help – it lays out the ‘rules’ for creating marketing content in an entertaining and refreshing way. Even if you already know much of what it says on a theoretical level, the book’s enthusiasm is contagious, and you’re bound to come away with new ideas and inspiration. Better yet, authors Handley and Chapman actually follow their own ‘rules’ by writing a book that is fun and engaging. Others undoubtedly will take away different favorite insights. But I’m willing to bet that you’ll find something of value in the book, no matter how far down the path to you are towards content marketing nirvana. And you’ll even enjoy the process of reading it. Anne: Thanks so much for this post. We DID set out to write a book that didn’t just plod along, as so many do. And as I said in LinkedIn, your headline makes me laugh.. and is one of the best I’ve seen! Well, your book made me laugh more than once! I’m trying to spread the word about how much I enjoyed it.